It’s almost that time again to enjoy all the tasty food and of course to let the people around you know how much you appreciate them. 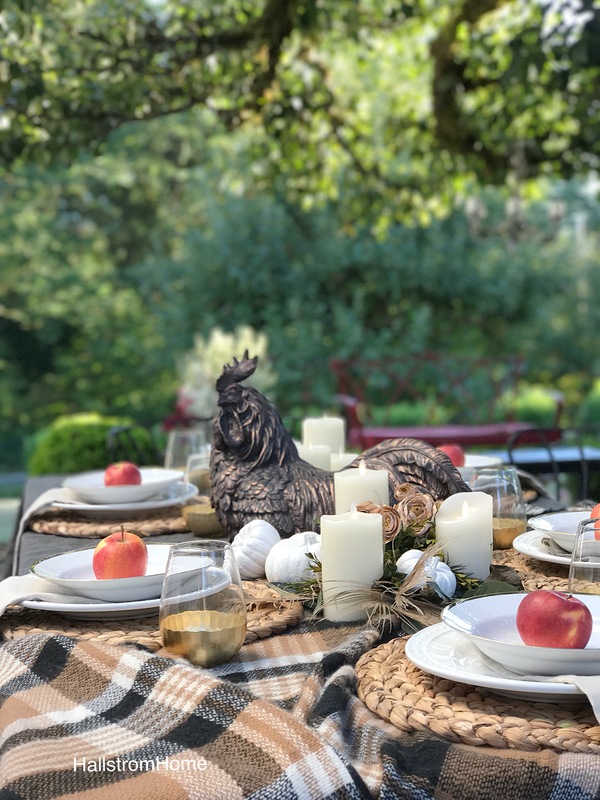 Here is My Thanksgiving Table with Apple Crumble Dessert. Of course I also have to share a dessert with you guys too! What’s the point of a great meal without some dessert? 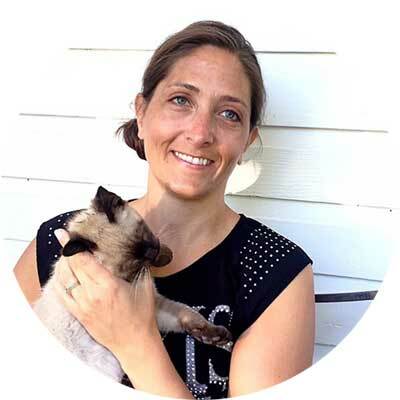 I will also include affiliate links! Let me start off by telling you guys a little secret, but don’t tell anyone! 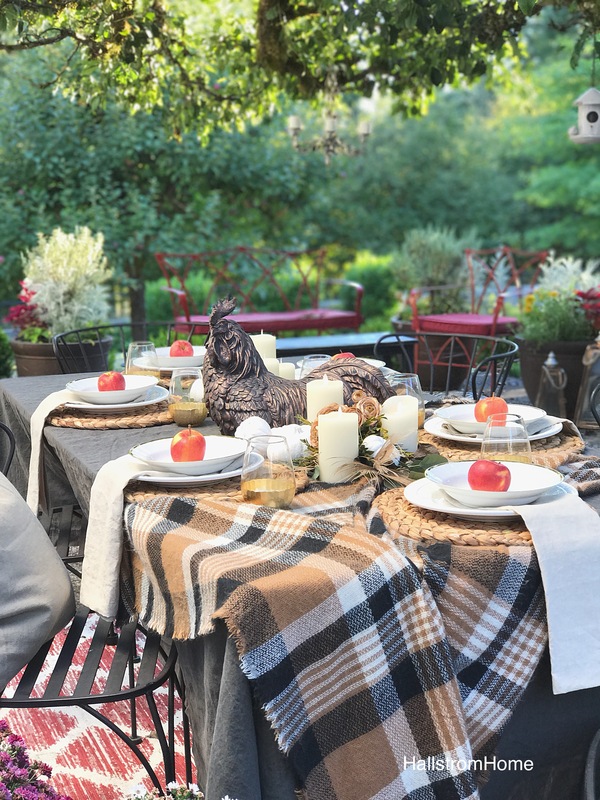 That cute plaid table cloth…is actually my scarf. I know, pretty genius!! Of course I wanted to go with Fall colors here, so I kept it pretty natural. But I did need a pop of color, so I added some fresh, crisp, red apples. I just love Mr. Rooster, don’t you guys? 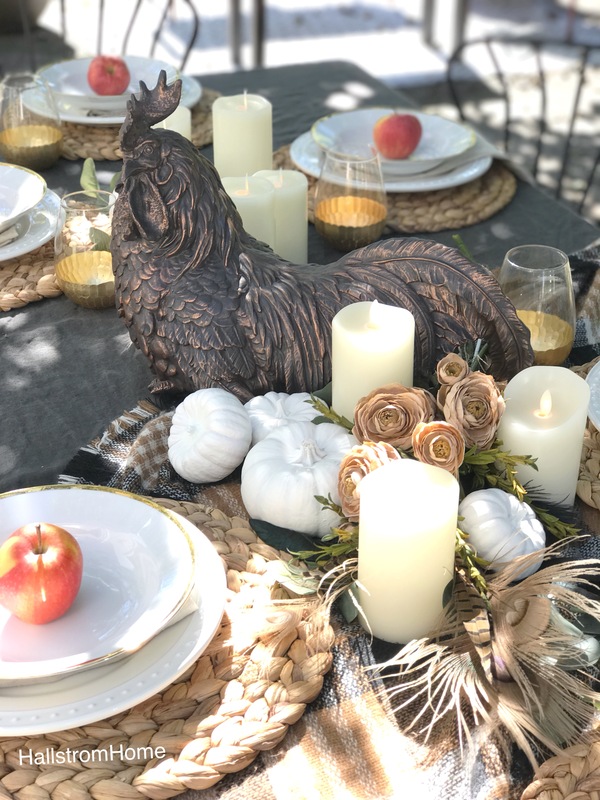 This was a very simple centerpiece to put together, but with all the different elements it all works well. 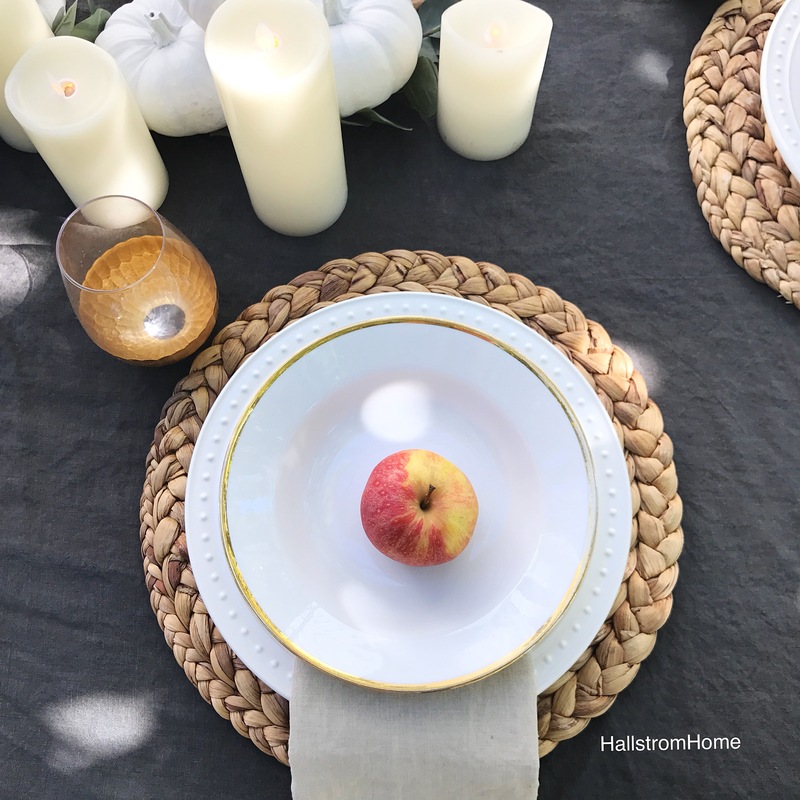 Painting your own pumpkins is a fun and easy way to get a custom look, here’s a diy on how I chalk painted my pumpkins. 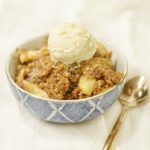 When I was a newlywed I wanted to can Apple Betty with my mom. So my mother being well experienced showed me the ropes. But we got a little carried away, and ended up with so many jars! With just a house of two and one on the way, hubby was teasing me that the baby wouldn’t eat that much Apple Betty. To this day I still get some laughs from hubby because of that! To make this table even more inviting I added some gold. Gold is always good when you’re trying to get that elegant look. 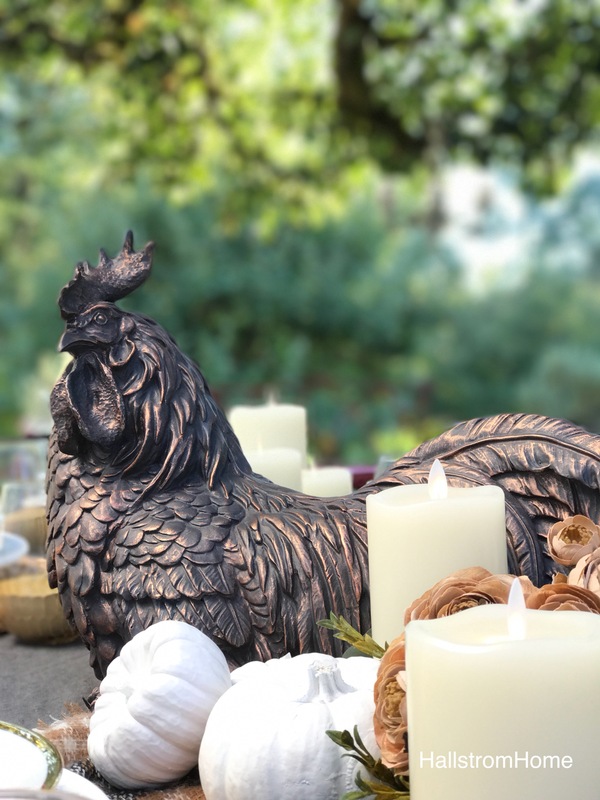 The rooster is a great centerpiece! Linens also make a space more elegant, I highly recommend linens. They are so soft, but also very durable you can find them in my shop here. Don’t you just want to bite right into those apples? Okay maybe it there was some caramel to go with! But wait I have a better idea.. Apple Crumble!! So yummy! I have a wonderful recipe that one of my friends make. I’m telling you it so tasty! 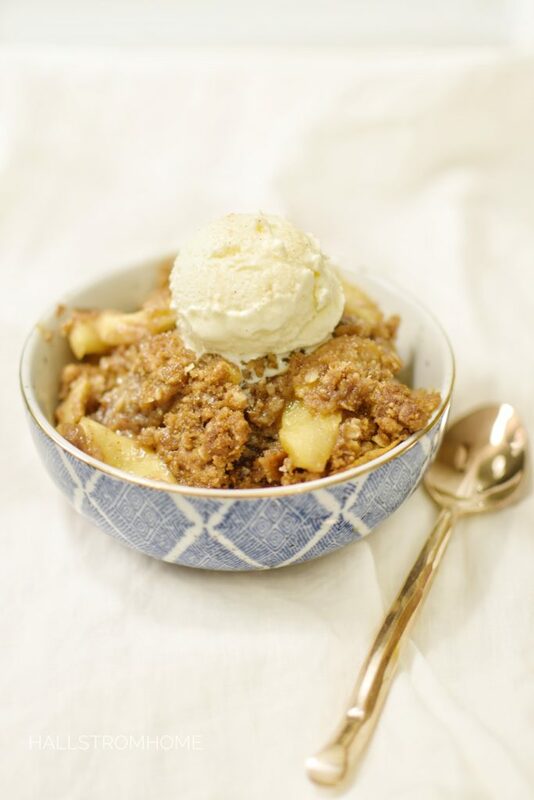 Apple Crumble is oh so delicious. This is the best treat for a party or just at home desserts. Combine all the crumble ingredients. Press half the mixture into a 9 x 13 pan. Once apples ingredients are mixed, place apples over pressed mixture. Press the remaining crumble on top. If you make candied pecans, sprinkle on top of the crumble. Combine cut apples, cornstarch, and brown sugar. The cinnamon is optional. Pour mixture over pressed crumble. Combine all ingredients except the pecans in a skillet and cook over medium heat for 1-2 minutes, until the sugar dissolves and the mixture is bubbling. Adding candied pecans or raisins is oh so good! Since this is so yummy, I’ll share her cookbook so you can try out some more delicious recipes. 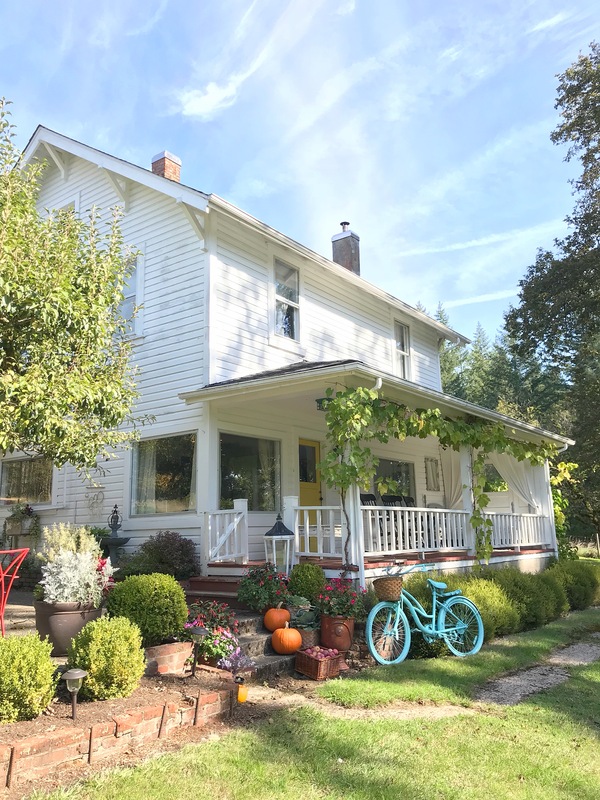 Here’s what the farm looks like in Fall. No this is not how it looks everyday, because it rains…all the time here in the pnw!! Leaves are starting to change oh it looks beautiful. Come take a look at my Instagram and see my drives and walks around the Pacific Northwest. I know you’re looking at that bike, it’s pretty amazing I will admit. I wrote about painting my bike blue here. I highly recommend painting your bike, any color you want, it’s so fun to do! 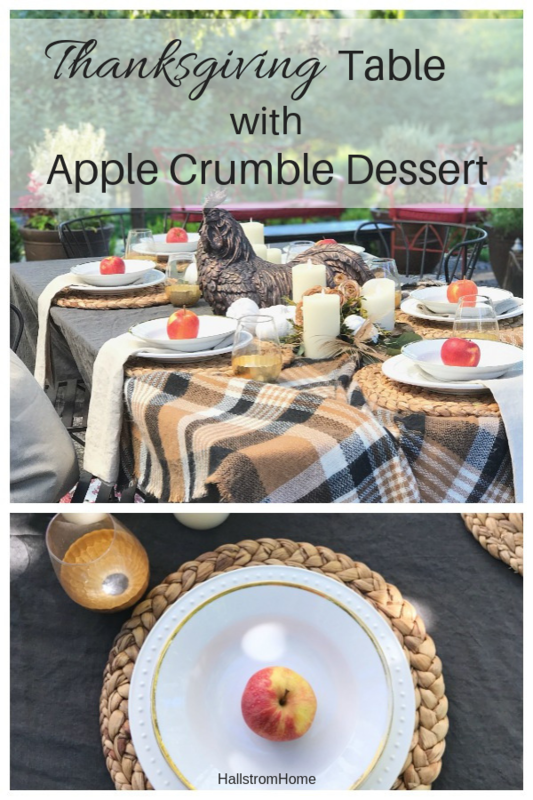 Let me know in the comments on how your Apple Crumble tasted!